Friday, November 1st, will provide you with a great opportunity to view new products, talk to manufacturers, learn new technologies, network with other plumbers and contractors, and also have some fun. The highlight of the day will be the Illinois PHCC trade show from 12:00-4:00 P.M. Come see the latest products, tools, trucks and technologies. Admittance to the 2019 Expo South is free of charge. Food and Prize drawings will be held throughout the show. The Illinois PHCC has scheduled Friday, March 20, 2020 as the date for our annual trade show. 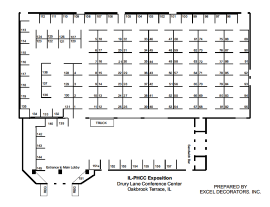 The EXPO will once again be held at the Drury Lane Conference Center in Oakbrook Terrace, Illinois. The March 20th date will be a day for educational opportunities and attending the EXPO. We are planning to provide programs for both contractors and technicians. A 4-hour continuing education program will be offered on Friday morning. This will be held in the theatre and will allow us to provide up to 900 people with their CEU credit. Exhibitors and attendees are both invited to relax and unwind at the Illinois PHCC sponsored "After Expo" Reception. Above you will find a link to the floor plan and contract for the 2020 EXPO. Many booths have already been sold, so act now to reserve your space for the event of the year. Please feel free to contact me with any questions. Thank you for your past support of the Illinois PHCC.